The time and date of the urgent meeting will be communicated later on. Immediately after the meeting, H.E. 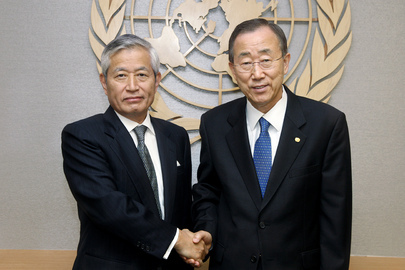 Mr. Yukio TAKASU will speak at the Security Council's stakeout. Please note in advance that for any further inquiry by phone or e-mail on the above-mentioned matter, we will not be able to make any comment. Japan's letter is being put online by Inner City Press here. A visit by Inner City Press to the UN Security Council found the door locked with a "D" bicycle lock, a food vending machine blinking in the corner. While word went out of an emergency Council meeting for Sunday morning, there was grumbling about the UN Secretary General, Ban Ki-moon of South Korea. When first asked about the impending launch by Inner City Press, Ban's spokesperson had no comment. Inner City Press: Does Ban Ki-moon have any, or does the UN in general, [reaction] to these two journalists that were imprisoned in North Korea and are being, some say held as human shields or whatever, are going to be put on trial. What’s the UN's response, statement on that? Spokesperson Michele Montas: I don’t have a statement at this point. The Secretary-General regrets that, against strong international appeal, the Democratic People’s Republic of Korea (DPRK) went ahead with its planned launch. Given the volatility in the region, as well as a stalemate in interaction among the concerned parties, such a launch is not conducive to efforts to promote dialogue, regional peace and stability. The Secretary-General urges DPRK to comply with relevant Security Council resolutions, and all countries concerned to focus on ways to build confidence and restore dialogue, including the early resumption of the Six-Party Talks. The Secretary-General will lend his full support to these efforts.